The Nissan BNR32 GT-R is very hot property at the moment. That’s mainly due to the fact that early model cars have reached 25 years of age, meaning they can legally be imported into the US for road use. Here in Australia, however, ‘Godzilla’ has been a part of automotive culture since the early days. While the car I’m about to show you may not be the most modified or extreme embodiment of the R32, it’s without a doubt one of the most interesting road vehicles around. When friend and fellow photographer Stefan Trajkovski sent me the above photo, I knew I was in for something special. 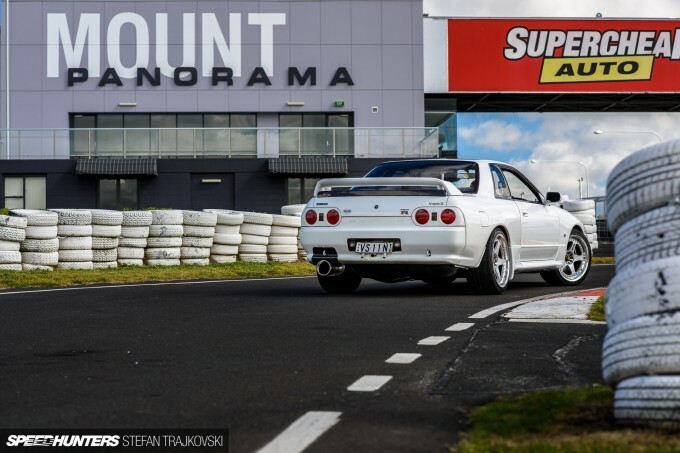 Not only is Stefan one of the most gifted photographers I personally know, he’d also managed to combine two icons of Australian motorsport – the Mount Panorama circuit at Bathurst, and a gorgeous R32 GT-R.
On closer inspection I realised that this was not just any old BNR32, but an exceptionally rare GT-R V-Spec II N1. Before we jump in for a closer look at this very special vehicle, let me show you around the hallowed ground of Bathurst. Bathurst is actually a nearby town that has contributed its name to the racetrack more correctly known as Mount Panorama Circuit. 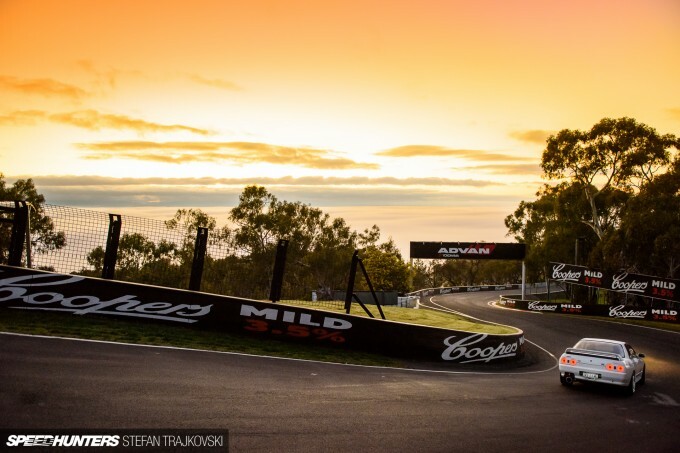 First used as the setting for Australia’s 1938 Grand Prix, today it’s home to the Bathurst 1000 and Bathurst 12-Hour, premier endurance events on the V8 Supercar and GT calendars respectively. In the intervening years, it has been the home of Australia’s most exciting and controversial motorsport battles. One of the most notable aspects of the circuit is the extreme elevation change from top to bottom – 174 metres from lowest point to highest of its 6.2km length. Concrete walls hug the tarmac tightly, which means a mistake at Bathurst almost never ends well. Open wheelers and motorcycles haven’t raced competitively at Bathurst since the early 2000s for this very reason. The track is actually a public road for 343 days out of the year. Upside: you can drive it in your road car anytime and get awesome photos like these. Downside: there is a 60km/h speed limit that is very strictly enforced. The circuit’s extreme nature has earned it a fearsome reputation, and names like ‘The Cutting’, ‘Brock’s Skyline’, ‘Conrod Straight’ and ‘The Chase’ are all elements of the track well known to those who follow Australian motorsport. 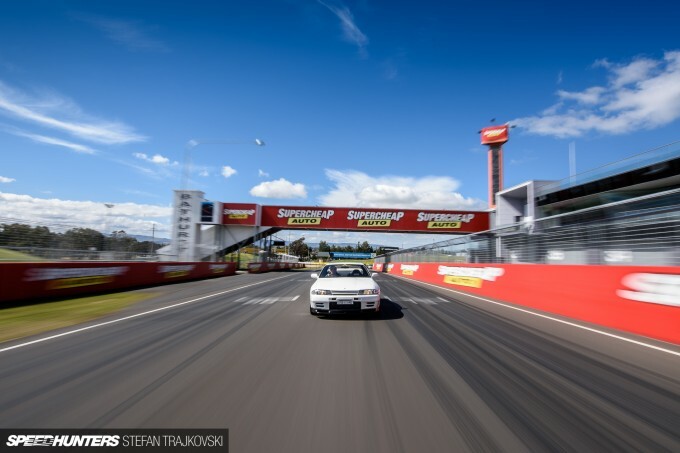 As I’m writing this article, the Bathurst 1000 – the circuit’s best-known event – is getting underway. Already there’s been plenty of carnage, just one example being Chaz Mostert’s vehicular obliteration at the Forrest’s Elbow corner. 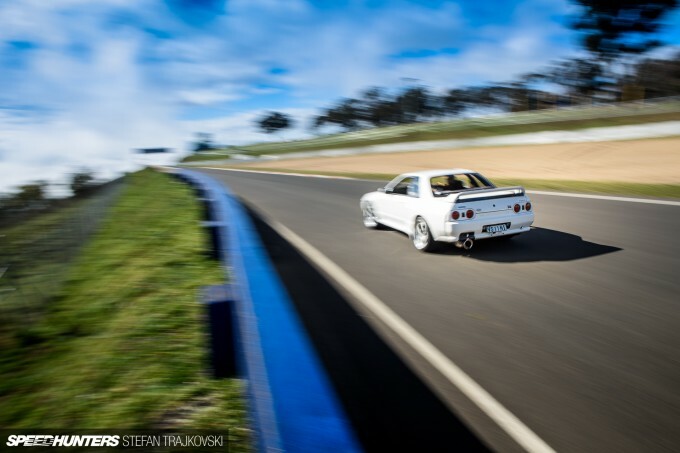 The R32 GT-R first came on to the Australian racing scene in 1990 in the hands of Gibson Motorsport. The debut season was fruitless as the team and drivers came to terms with the 600hp turbocharged, all-wheel drive monsters from Japan. By the following year the cars had been ironed out, and the Nissans absolutely dominated. In the hands of Mark Skaife, the #1 GT-R took pole, the race win and fastest lap – followed by another GT-R. The same team returned again in 1992 to take the win again, although under controversial circumstances which led to Jim Richards infamously calling the disapproving crowd “a pack of arseholes” from the winner’s podium. In 1993 turbo cars were outlawed and Godzilla was relegated to the history books. This was a move to restore parity to the series, or in other words – give the other teams a chance. The extreme power and handling of the GT-R couldn’t be managed by ever increasing weight penalties, so the rule makers stepped in. 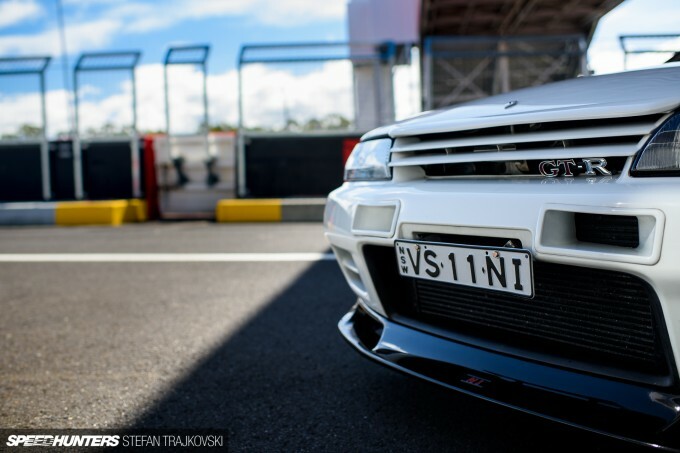 If anything, this controversial history has given the R32 GT-R a level of reverence amongst Australian motorsport fans. 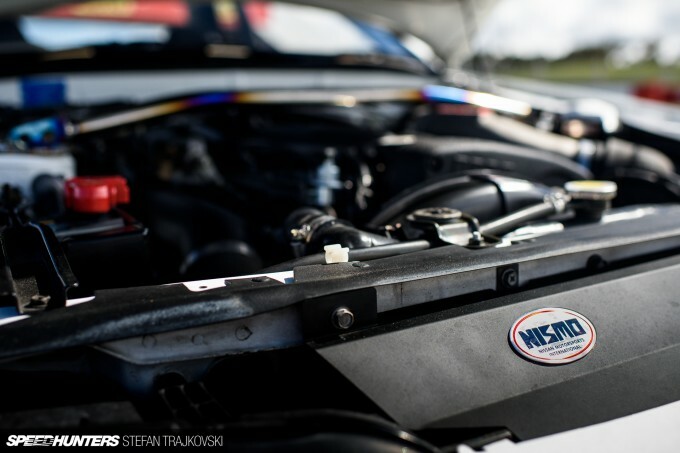 The link between this car and the Group A racer is especially close, as the N1 is the road car Nissan had to build for its race cars to be homologated. Our feature on the aforementioned Gibson Motorsport machine of Skaife and Richards is a great place to start if you want a closer look at a proper Group A competition car. Although the spec list was long for the N1, the options list was the opposite – no ABS, air conditioning or sound system, while all cars were delivered in the same thin coat of Crystal White paint. This meant a saving of 30kg compared to a regular GT-R. The changes under the bonnet are hard to spot, too. 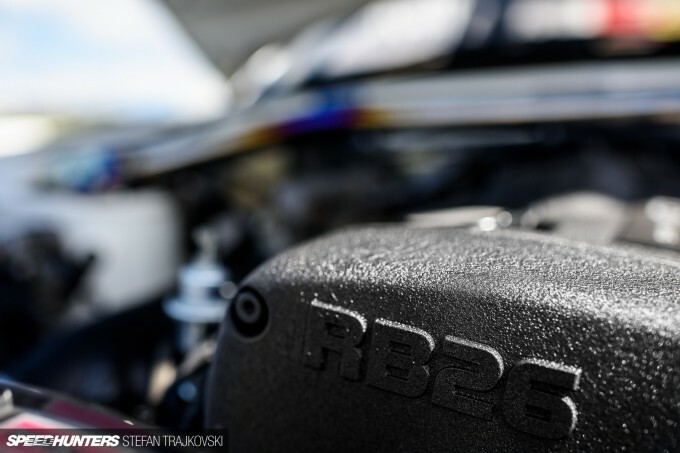 The RB26 block is a special unit for the N1, with enlarged channels to assist cooling under race conditions and upgraded internals including a balanced crankshaft, pistons and cams. Nismo-designed turbines replace the standard units, providing both a lower boost threshold and higher total output. With the sole power modification being an HKS exhaust (with a Nismo tail pipe shroud), the car makes a dyno-proven 301kW (404hp) at the wheels – significantly more than Nissan ever laid claim to. So to sum things up: less weight and more power than your run-of-the-mill GT-R, like a Porsche RennSport model. Only this is much, much rarer. In fact, the owner of this car, Terry, tells me that only 48 examples were ever made. Considering the racing pedigree and rarity, the BNR32 GT-R V-Spec II N1 is undoubtedly a very collectible and important vehicle. Some would argue that if you own one, now might be the time to start thinking about having the car encased in a hermetically-sealed bubble and stored away under lock and key. Terry disagrees. 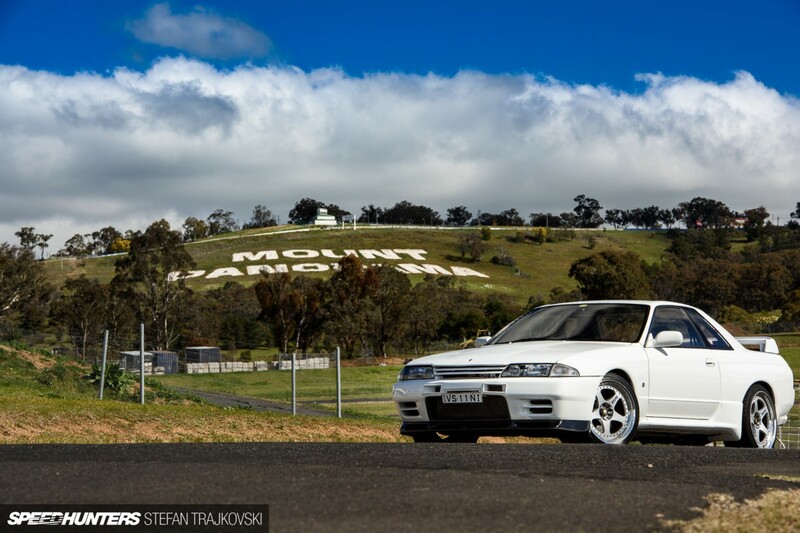 If you want to see a genuine N1 in the flesh, there’s no need to buy a ticket to the Nismo museum in Japan – you can just head out to one of Terry’s favourite back roads north of Sydney. Despite being in his 60s (it’s the new 30, he says) Terry loves nothing more than chasing down Porsches on a Sunday morning. And in my books, that makes him a bloody legend. When he imported the car from Japan late last year it had a hair under 50,000km on the clock and was a real minter. Even the early ’90s interior plastics look brand new. Not only is Terry happy to drive the car as its maker intended, but he’s also not afraid of a little tinker here or there to get the car just right. Exhibit A: this Rocket Dancer titanium front strut brace, which stiffens the front end and as a result gives a slight bias towards oversteer rather than the hint of understeer Terry wasn’t fond of. There’s a whole catalogue of genuine Nismo parts scattered across the GT-R too, most sporting the old school logo that is as ’80s as playing Top Gun on your NES while your sister does her best Flashdance rendition. To start with, Terry hated the retro font, but he’s come to love it over time and even sports a vintage race jacket emblazoned with it now. 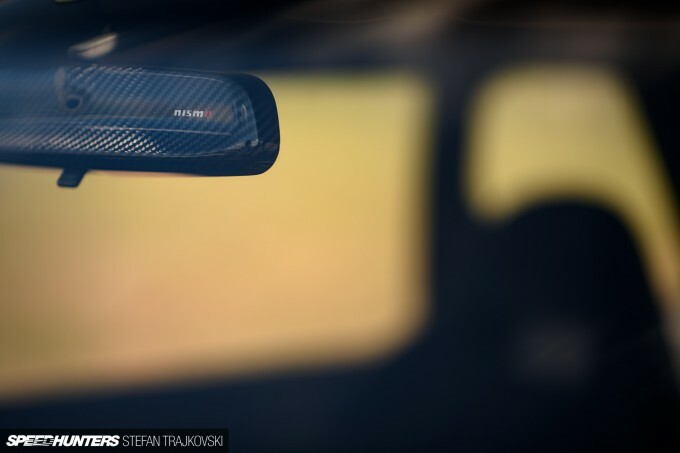 For the most part, these are dress-up additions, and Terry intends to keep any future modifications limited to items that can be removed if and when the requirement comes for the car to be returned to stock. 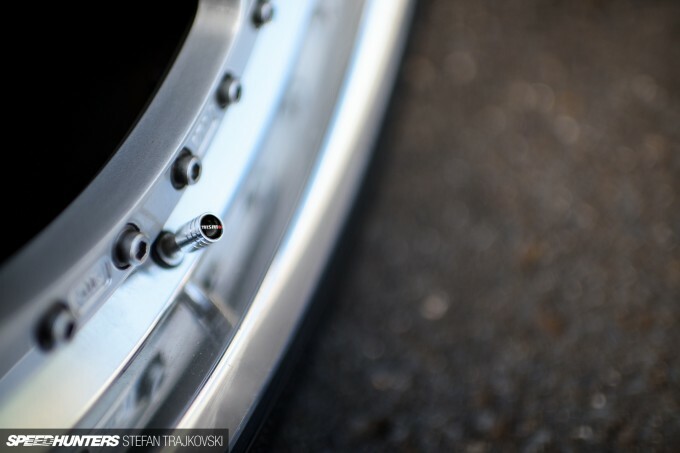 Stealing the show are the RAYS-made Nismo LM-GT1 wheels in a square 18×10-inch fitment all around. 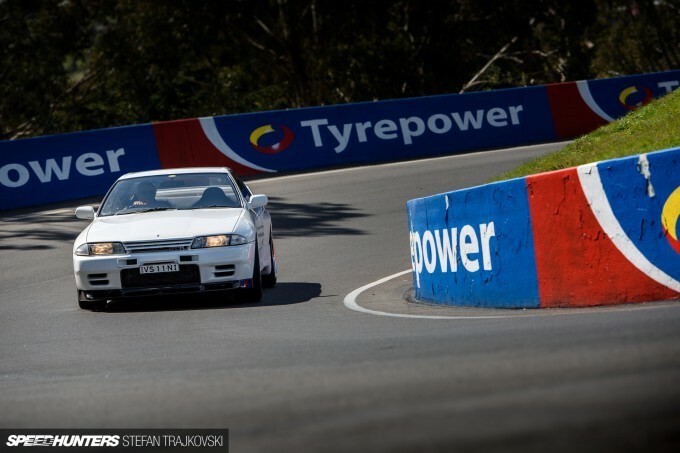 There’s no intention to race the car or anything too extreme as Terry has (in his words) “had his fun” on track in his previous car, an R34 GT-R that was more modified. I asked Terry how the R32 compared to its younger sibling and he said the most noticeable difference was the heavier steering in the R32, otherwise they are remarkably similar in character. If I wasn’t a fan of Terry already he cemented it when he told me his son now owns an R34 GT-R V-Spec II Nür. Family goals! It’s pretty clear to me that Terry is the perfect custodian for this iconic vehicle; a passionate enthusiast who will not only care for it but give it a decent spanking every now and then. Ever notice how you can tell a picture was taken in Australia just by looking at it, without needing captions? It's like there's an obvious and specific combination of lighting, foliage and terrain that stand out instantly. This is both a fascinating and hugely admirable car and owner. Great read, must make it to Mount Panorama in the future. Ice Age Yup, I think the same of SoCal photos too. I think this might be my favourite SH article to date :D. Perfect car, location...stunning photos!!! Saving a bunch of these for sure! Lots of nice NISMO parts on it. This car is quite a curiosity being both a Vspec II and an N1 - without a doubt the king of factory package R32's. 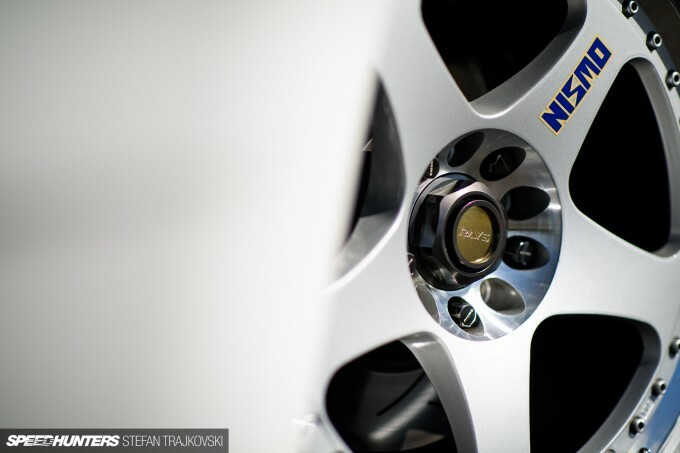 You get the larger brembo brakes of the Vspec ii package and the power boost / weight savings of the N1 package. Although it appears Terry installed a radio in his radio-delete car... Can't blame a guy for wanting some tunes every now and then. Beautiful car built with quality parts and it's nice to see it so well cared for. Cheers. Brilliant photos, and an equally as pretty car. Paddy McGrath Ice Age ^^^ as a resident of SoCal, I will state that we've had almost 2 months straight of drop-dead sunsets that photogs only dream of. The lighting on this shoot is fantastic. And what a car! @RicardoSmits Absolutely! In Sydney I get a buzz seeing a nice, stock example of something like that. Awesome write up and pics by the way! 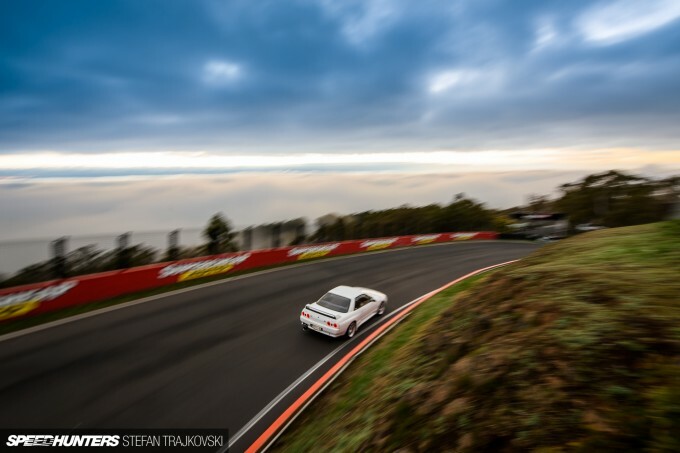 In my family it's almost a right of passage to do a lap of the mountain at least once a year, to do it in a GTR this special would be a blessing. I do need to say, everyone I know who has gone says the same thing "man its steep up there". If you want to really find out how steep it is, drive around it the other way! Yes it is a 2 way road! And boy you realise quick how silly steep it really is!! 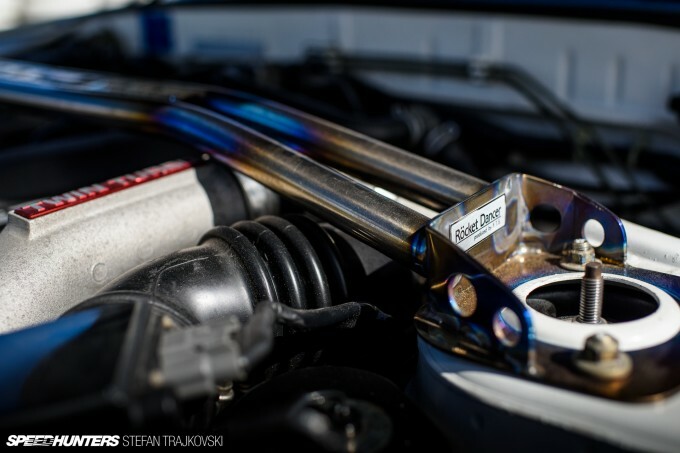 Blake Jones you are the best person Speedhunters has ever hired! As an Aussie living in Britain I love reading about the scene back home, and you always capture it so well, which is so impressive considering how eclectic the mix is! Keep up the awesome work! Great photos. Well done to Terry for finding and keeping the car immaculate. Hot property in the US maybe with them now being legal(prices in Japan might go up due to the growth in imports to the US, but they've remained the same value(with a slight drop) for a very long time here in Aus and are hardly uncommon or hard to find. Looks lovely in white, by far the best colour for them and why anyone would buy grey or maroon I don't know.....such a strange colour for a car like these. If they came in Midnight purple, then it' be game over for colour choice! Pierrewashere The problem with that is they lose their uniqueness and become just another Skyline that blends in with all the GTS's IMO. Riddlah There's one in Brisbane that I've seen out and about a few times, so they do get used, which is great! RicardoSmits Ice Age I saw a bog stock S15 the other day and it caught my attention more than any modified one I've seen of late. Pierrewashere R32's are the one model that don't really stand out dramatically from GTS to GTR for me. Of course I can tell the difference easily, but they just don't have the width, the toughness, the really obvious body differences like deeper bumper and larger wing etc that the 33's and 34's have. Once apon a time they were $20k finding one for less now.........ha!! 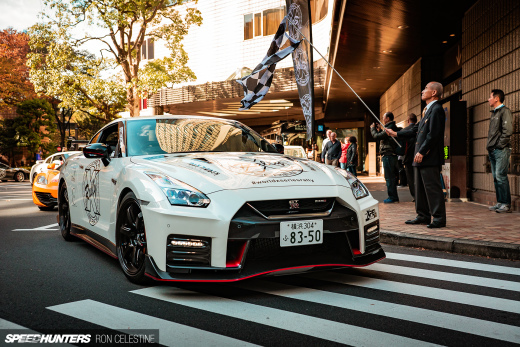 There's still a lot of people who dont know Australia was the reason the GTR's are known as "Godzilla"
Chris 'Haffy' Hafner There's usually half a dozen to choose from for sub-$20k or just a couple of $k over, so that's not impossible. They've been about the same price for years and years...it's not as if they've gone bonkers crazy in price. Great car, great mods and even better everything is reversible once needed. Just what the car desires. great work! Love this story! And this R32 is in absolute mint condition! Spaghetti Yea, the whole gunmetal grey R32 thing... If I see one in any other colour I'm definitely more interested, which probably isn't fair, but I've seen so many of the damn things in my life, it's hard to get excited. 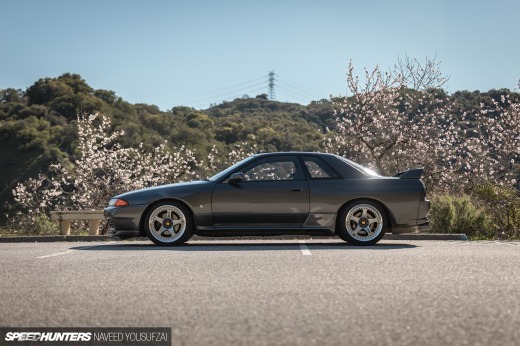 It makes me wonder; if gunmetal grey was the least common R32 colour, would I love it and think it looks amazing? I am so glad Terry actually DRIVES the car. I hate it when people buy cars and don't drive them. I always knew the N1 was a rare car, but until reading this article did not realize how significant it was. 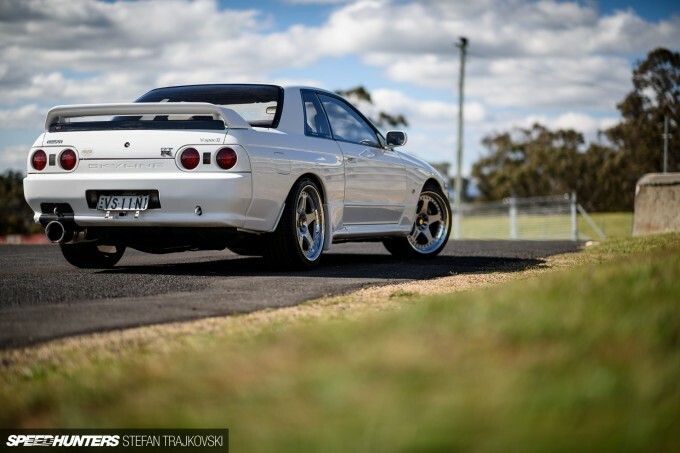 About 6 months ago i sold a set of old go jacks, and the purchaser rocked up in a white R32 GTR on gold BBS lm's. The owner told me it was an N1 and let me have a look, showed me it had no stereo or abs from factory, and pointed out other things such as the boot lip spoiler. If i knew that there was only 48 of them made i would have spent a-lot longer admiring his car! Sick of reading the repeated story of the GT-R being banned, or turbos banned, or other teams being given a chance. Sorry but it is total BS. The GT-R was literally the last new car homologated for Gr. A, in '89. The rest of the field were evolution versions of cars homologated from 1984 through 1987, in the main. Group A ceased to exist for FIA international competition in 1988. It ended in Britain in 1990. It ended in Australia in 1992. It ended in Japan and Germany in 1994. 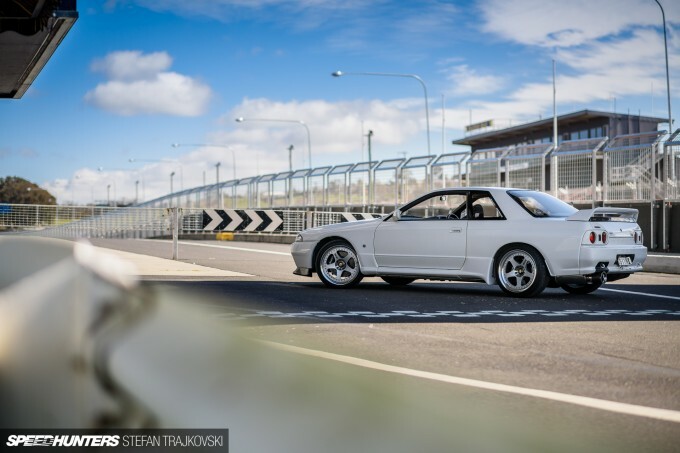 The GT-R was practically homeless and extremely expensive to run by '92 in Australia, and was heading a field of old, often market-irrelevant cars which nobody was interested in watching. Track attendance tanked, so did TV ratings. Sponsors abandoned ship. Cams Group 3A (which became V8 Supercar) evolved as a means of getting public interest back. As for 'giving the other teams a chance'... The GT-Rs did get extra weight added. So did the M3s; the same 50kg added to the GT-R, a considerably larger penalty in proportion! The RS500 Sierras and Commodores were rev limited to 7500rpm. Gibson Motorsport effectively rigged the bench test devices for the boost limiting pop-off valves assigned to the GT-Rs - I won't say they cheated - in order to give CAMS the bench test results it was looking for and subsequently continued on with only very minor loss of power. So, if anything Gibson very effectively bent the rules to negate one restriction and received a comparatively minor penalty. In the end all the teams went to the new 3A parity formula in '93 so it's pretty academic. 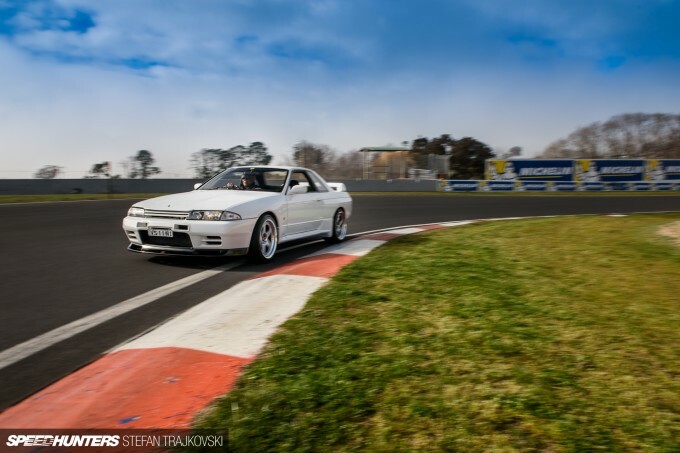 The GT-R wasn't banned any more than the M3/M3 Evo, 323i, 635CSi, Starion, RS500, Toyota Corollas, 70 Supra etc which were almost all gone by the end of 1993 and fully transitioned out by the end of '94 were banned, the category simply did not exist. Reality is by the early 1990s nobody was interested in watching some techno hyper car lapping a field of clattery old capacity class warriors, some dating back to the dawn of the 1980s, nobody was interesting in stumping up the huge sponsorship sums to support race teams nobody was watching. This is why Gr. A was finally scrapped in Australia, 4 years after it's demise as an international category, replaced by CAMS 3A/V8 Supercar which has gone from strength to strength for 22 years unlike Gr. A which was controversial and of questionable relevance from it's inception. Sorry if that doesn't gibe with the GT-R mystique but that's reality. It was a big shark in a small pond, arguably taking some growth enhancers. I wonder what's the value for this car? "this Rocket Dancer titanium front strut brace, which stiffens the front end and as a result gives a slight bias towards oversteer rather than the hint of understeer Terry wasn’t fond of." First time I've heard that a strut bar can induce oversteer. 228 total N1's produced is a number I have seen, spread from 1991 to 1994. Either way rare, the exact numbers don't matter much, except to us number nerds. seventhskyline you seem to know a lot about this! I was but a toddler in '92 so I'm merely imparting what I've been told, so thanks for taking the time to share that info. @Nick Thanks for the support Nick, you're too kind! Blake Jones seventhskyline No worries, it just irks me when I read that stuff as someone interested in the cars and the era. I'm not sure how it got started. 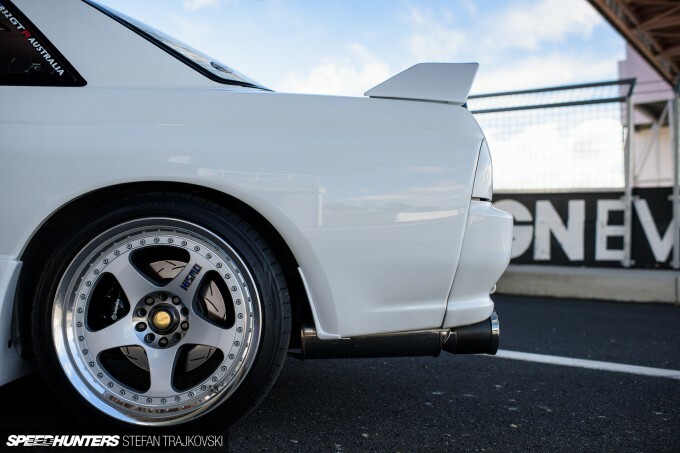 The N1 special model designation rather than a 'Group A' one is a big clue as to where they were focused by that stage though; really the only place a production based GT-R had left to race by '94 was production car classes and N1. Some beautiful shots in this post. The photogenic track combined with a beautiful car and sky. @Beany If the front of the car is floppy it absolutely can. Noticed the same thing with my E30 318is. seventhskyline Very interesting perspective - it still sounds like the GT-R was a kick in the reggies for the backwards bogans that just wanted to see the same old field of domestic V8s clatter about year after year. There was some great engineering and tight competition there but rather than accept progress and change, the fans just walked away from it. Slappy_Pistons seventhskyline I think you're a little off the mark with that comment, there were several teams running V8 Holdens in the late 80's/early 90's, but just as many running Sierra RS500's (which were pretty dominant before the gtr came along) and several running bmw M3's. The only domestic V8s were Holdens, and as seen in the WTCC/ETCC the commodore platform was no slouch. Rest of the field was made up of European and Japanese cars, a large portion of which weren't even available in Australia. If Gr.A had continued on it would have been a laughable situation of the GT-Rs competing against a field of 7 to 10 year old cars that were mostly never sold here; not very interesting to Joe Public. Worth noting that the M3s - by 1991 a superseded chassis platform- gave the GT-Rs a very hard time despite being hit half as hard again with the 50kg weight penalty. seventhskyline Blake Jones Was the Japanese N1 class similar to US Showroom Stock classes of the same vintage (late 80s to early 90s)? Looking forward to your reply. Loved the article. Well written and loved the back story of the owner. I don't know much about the USA racing category system. N1 is basically FIA Group N, a bit tighter than Group A, and in Japan it evolved into Super Taikyu. Paddy McGrath Ice Age It's funny you say that Paddy, because SoCal is also one of the few places that occasionally makes me double take for Australia; it's the Eucalyptus! The answer is obviously subjective. 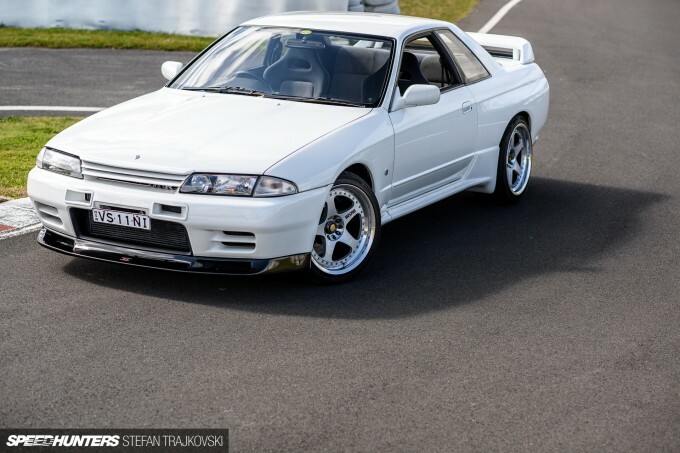 But there is another R32 GTR V-Spec II N1 for sale here in Oz for $150,000.00. Once that car sells, I guess we'll have a better understanding what the market deems the car is worth. jbfromsiliconvalley too new for the US. Has to be over 25 years old. Still a couple more years. Very nice car. 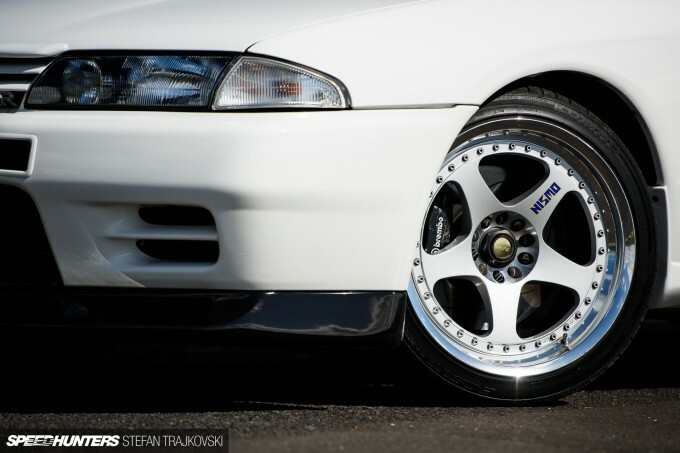 All the rare NISMO components....those wheels...R32 heaven.